One thing I appreciate about my job is that I get to dream big. But when you dream big on a video project- there's a tension between the concept, the time you have and the resources available. In the end, we usually land somewhere in the middle of all those things. If I can say to myself when we're done that I gave it my best effort, and that the project was as good as it could be with the time, resources, skill, and knowledge I had at the time- then I'm satisfied- even if the original concept was scaled down somewhat. Occasionally, however, I'm able to create a video that is exactly what I had in mind at the beginning. We dreamed big, and we got there. To me those are the most rewarding projects to work on. The past two Easter videos I've directed and created at Lincoln Berean hit that mark. That's not to say the end projects were 100% flawless, or that they're the greatest videos ever created. From a technical standpoint there are things that could still be improved upon, sure, but in the end the videos were exactly what they needed to be, and exactly what we set out to create from the start. Below is the 2018 Easter opener at Berean- Darkness wins. It's based on 1 Corinthians 15:16-19- what if there was no resurrection? The Christian faith centers around the belief that Jesus resurrected from the dead. If there's no resurrection, then the whole thing collapses. My first job for this project was to write the script. In this instance, it was a dark poetic piece with no real resolution. As I wrote it, I envisioned scenes that could go along with the concept. I talked to others on our production team for inspiration- and I found out that the stage design was going to be a giant wall with cups lit up to create pixel art of a cross and a tomb. It would look like a light bright. 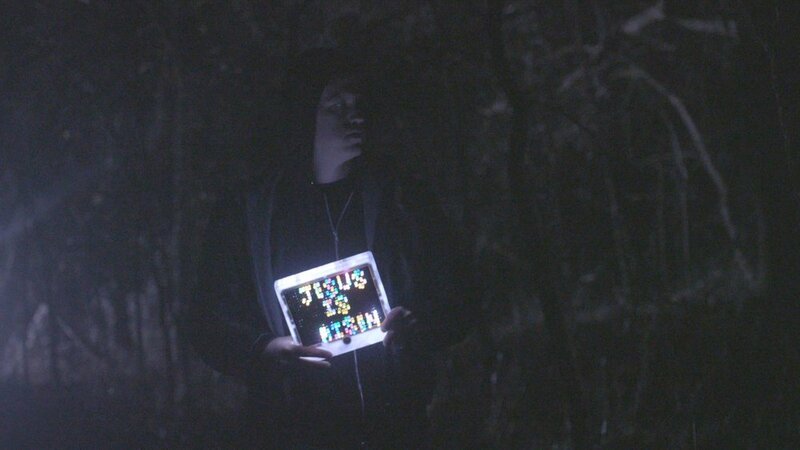 I love it when the elements on the stage and in the video can tie together somehow, so I thought long and hard about how a lite brite could possibly connect to the idea of the resurrection being a lie. The Bible says that our faith is a "light unto our path." It seemed to me that if Christ weren't resurrected, that light would be weak, and unable to actually light our path. It would be a light that would make us feel better about ourselves, but not powerful enough to really help the lost find their way. We wanted this video to set tension leading into the message. At first I thought that a little boy getting lost in the forest at night could be too much, but as I thought about the state of our souls without the hope of Christ, I realized it was actually very appropriate. Once the analogy was in place, I went to work on pre-production. I cast my son, Judah, and started planning. As I started planning, the shoot got bigger and bigger- and I was reminded again that more time in pre-production = less problems during actual production. In the weeks leading up to the two scenes, I even filmed test shoots. For the opening scene, I just did a test shoot in my unfinished basement, and then a test shoot in the forest with one battery powered LED and my good friend Brice as a stand in. Doing these test-shoots were so huge in helping me work out kinks before the actual shoots. I especially learned that lighting the forest scene was going to be quite the challenge. Because of the pre-shoots, when the production time actually arrived I knew exactly what shots I needed to get. Last, but not least, was the forest scene. We had to get a film permit and our location was about a half mile into the forest so that we'd be far enough away from any city or traffic lights and be in total darkness. In all we had 7 people helping throughout the night, and this scene could have never happened without them. I'm so thankful for everyone who helped out! We hired Ben- a local gaffer/grip to help light the forest and he did an incredible job. This scene was incredibly complex to light and without Ben's help it wouldn't have turned out nearly well. We used a generator to power two kino flo lights to create our ambient lighting throughout the scene, and then we had a couple of battery powered LEDs for more specific light needs on closeups. I brought my $100 fog machine to create atmosphere, but it had its limits. We could make just enough fog to last about one minute before we needed to make more- so we'd make fog, film a couple takes, and then throw some more out there. One of the biggest challenges I faced was that I was directing and operating the camera. On smaller shoots this isn't really uncommon, but I've found that the bigger the shoot gets the greater the need becomes for specialized roles. We were using a Canon C200 on a Ronin, and after a while the weight became pretty difficult to manage. The other big challenge we faced was focus. The autofocus on the C200 is normally excellent, but in a scene with such low light (shooting at 16000 ISO), there were times the camera would go out of focus without us wanting it to and we didn't have any remote focus abilities. But in the end we were able to push through the challenges and still get everything we needed. And then there was my son, Judah. On a set like that in a pressure moment, I had a lot of feelings I needed to balance as the director and the father of the lone actor. Without his cooperation, all our work would be for nothing. My son hasn't done much acting, and it would be way after his bedtime. I knew I was asking a lot, but I believed he could do it. He was awesome! He got tired at the end, like the rest of us were, but he pushed through. As a director, I was incredibly pleased with his performance, and as a dad I was incredibly proud. In the end, it turned out exactly as we hoped. All the work was worth it, and I'm so thankful for the many people who stepped up throughout the process to help in so many ways to make it possible. I learned so much through the course of doing this project. Most importantly, the video was exactly what God wanted it to be- and we trust that He used it in our Easter service to open hearts and minds to the message that was preached that day- that the darkness doesn't win. Even though the video ends on a dark note, you can imagine the resolution scene. It's a scene of a father rescuing his lost child. Our Father loves us deeply, and he found us when we were lost, and he walks beside us with light to guide us on the unseen paths.